As I've said often, I struggle with extremely dry skin, especially on my arms and legs. I love a really abrasive body scrub to slough off every last flake and crocodile scale, and recently turned to Jealous Body Scrub to get the job done. Bonus: they're Vancouver-based and I always love featuring local brands/stores/scenery when I can. 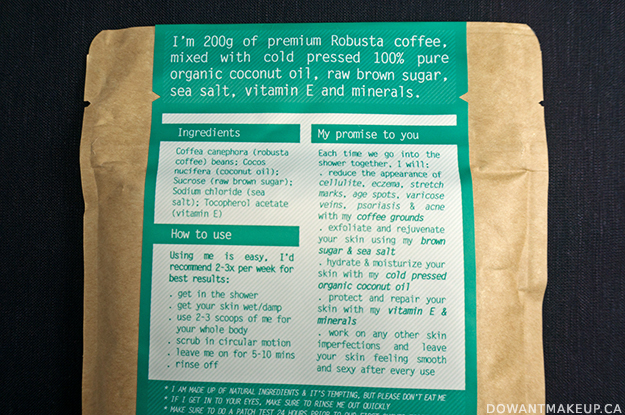 The scrub comes packaged in resealable, reinforced brown paper. I have had it in my shower for a couple weeks now, and the packaging stands up fine to a little moisture and heat without breaking down. It's stored on the top shelf of a shower caddy, so it gets a little incidental exposure to water, but it's not in the direct path of the shower spray. 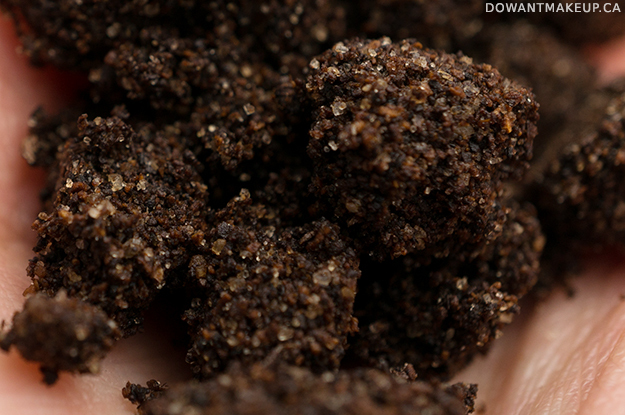 Coffee lovers will fall head over heels for the intense coffee smell of this scrub. What I like is that it's part coffee grounds, part brown sugar, part sea salt. In other scrubs that are salt/sugar-based only, the crystals start to dissolve from the heat and moisture of the shower, forcing me to apply more product if I'm not done scrubbing yet. 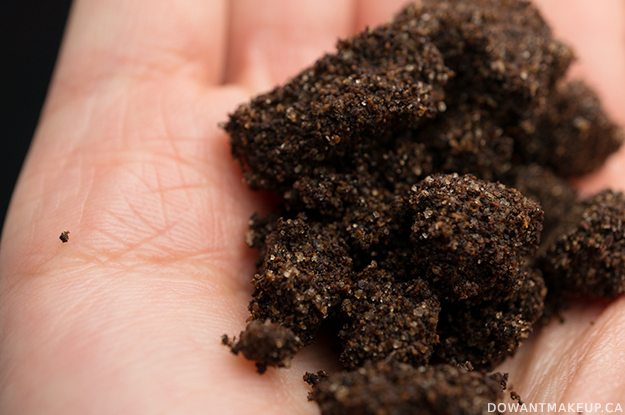 The coffee grounds don't dissolve, so you can scrub away all day if you wanted to. And maybe because of that, it's the most satisfying scrub-down I've had ever. It's deliciously super-abrasive (nothing uncomfortable about it) and I love it. You are supposed to leave the scrub on for 5-10 minutes before rinsing off, but I find it a bit impractical to just be hanging out in your shower for that long. Plus my hot water runs out easily so my showers are quick. But even on days when I can only manage a speedy 1-2 minute scrub and rinse, the coconut oil leaves my skin feeling extra hydrated and smooth. Slight drawback is that it is a little messy and your shower/tub will look like you are washing off the results of being in a mud wrestling match. I will usually have to give my shower a quick spray down (not a big deal) because coffee grounds are all over the floor and low on the walls. The coffee grounds go down the drain easily and I haven't encountered any issues with that. 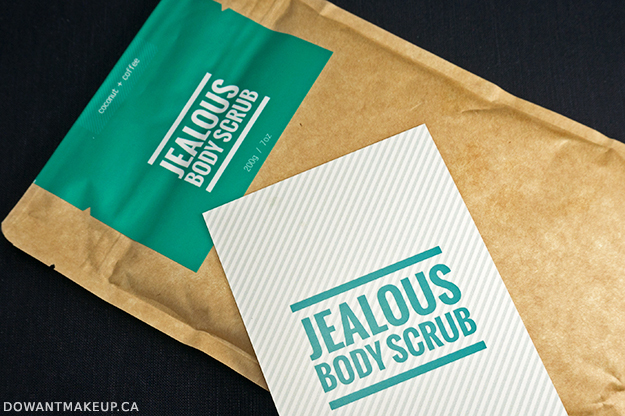 The scrub promises to "reduce the appearance of cellulite, eczema, stretch marks, age spots, varicose veins, psoriasis, and acne". Most of those conditions don't apply to me, but I can definitely say that the first rule of Fight Club Eczema Club is never scratch your eczema, even if it's with a very promising body scrub. My first time using it, I applied and scrubbed using both hands. I have eczema in the palm of my left hand, so that was a mistake--all that scrubbing really aggravated the eczema. Since then I've been applying the scrub only with my right hand, which is inconvenient but unavoidable with any body scrub until my left hand clears up. I do not recommend applying this to your eczema. Stretch marks, on the other hand: I've been testing this scrub over the past few weeks and have noticed an improvement. I don't have severe stretch marks (they're pretty faded) but I do think it helped reduce their appearance. The packaging states that this is an effect of the coffee, but the FAQ says it is the effect of the exfoliation and moisturizing. The coffee aroma lingers on your skin for some time post-shower. While I don't mind it, it can be a hindrance to applying other scented products. This would be an awesome treat for a coffee addict! At $17.95 CAD, some might feel it is a little bit on the pricy side, but it is one of the most satisfying scrubs I have ever used. I also feel like I use less compared to sugar- or salt-based scrubs, where I end up applying more product because the abrasive materials keep dissolving.